SEVEN-TIME CHAMPION Roger Federer reached the Wimbledon fourth round for the 15th time on Saturday with a 7-6 (7/3), 6-4, 6-4 win over Germany’s Mischa Zverev. Federer will face Bulgaria’s Grigor Dimitrov on Monday for a place in the quarter-finals. “I thought it was a fun match to play against a serve-and-volley player. You’ll always see some lobs, passing shots and drop shots,” said Federer after a fifth win over Zverev, three of which have come this year. The victory was the Swiss star’s 317th at a Grand Slam as he continues his bid to become the oldest ever Wimbledon champion. “We go one round at a time and I must say it’s always the first goal to get to the second week at some stage,” he said. Federer has never lost to Dimitrov in five meetings. However, just like the Swiss, 13th seeded Dimitrov has yet to drop a set at this year’s Wimbledon and was a semi-finalist in 2014. “Every time I play against him he’s stronger than the time before. He’s in the perfect age right now where he starts to understand his game best,” Federer said. “He’s physically strong, he’s mentally taken the next step again. That’s what you expect from a player of his calibre. Email “Roger Federer's bid to become the oldest ever Wimbledon champion is still on track ”. 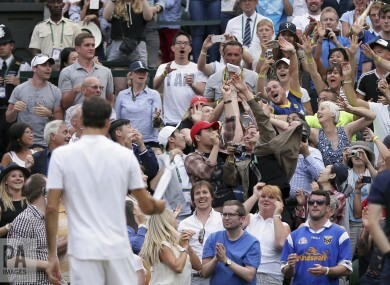 Feedback on “Roger Federer's bid to become the oldest ever Wimbledon champion is still on track ”.